Turmeric or Haldi is a common cooking spice in Indian cuisine and has quite a few medicinal properties. It can be used effectively to treat a number of problems and maladies. Asthma – Turmeric helps reduce the inflammation associated with asthma. Therefore, an effective home remedy for asthma is to mix 1 teaspoon of turmeric powder into 1 glass of warm milk, and drink this mixture 2 to 3 times per day. Unhealthy Skin – Turmeric helps the skin to retain its glow and its natural moisture and cleanses the pollutants so that the skin can maintain its health. 1 portion of Turmeric powder can be mixed with 4 portions of Honey to create a smooth paste. It can be then applied to those areas of the skin which are most exposed to the weather. This can be washed off after an hour. Sprain – A paste made with Turmeric powder, lime juice and salt and applied over the sprain gives effective result. Repeated application over the area eventually cures the pain. Health Drink – Turmeric powder can be taken with milk as a health drink to give a boost to the immune system of the body. Use 1 teaspoon of turmeric powder with 1 cup of warm milk every day. Throat Infection – Take 1 teaspoon of turmeric powder and boil it in 2 cups of water. After the preparation cools down, strain it and gargle with it for 3 to 4 times during the day. Indigestion – Make a decoction of 1/2 teaspoon of cloves, ¼ teaspoon of black pepper powder, 1/2 tablespoon of cumin seeds powder, 1/4 teaspoon of turmeric powder and 1/2 teaspoon of rock salt, pounded coarsely in 1 litre of water. Boil it down to 1/2 litre in volume, cool it and store it in a bottle. Take 2 tablespoons of it 3 to 4 times a day for 2 to 3 days. Eczema – Prepare a paste with fresh pounded Neem leaves and 1 teaspoon of turmeric powder mixed in sesame seed oil. Apply once a day. This is a very good home remedy for all types of skin problems. Liver problem – Take 1/4 teaspoon of turmeric powder and stir it in a glass of warm water until the turmeric mixes evenly with the water. Take it thrice a day adding a little jaggery to it. 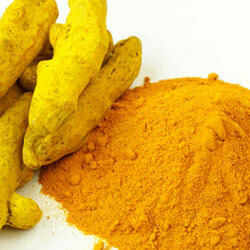 It is very beneficial for liver problems like jaundice, as turmeric has antiseptic as well as healing properties. Cold in children – Turmeric in combination with Caramel seeds or Ajwain is beneficial for cold in infants and children. 1 teaspoon of turmeric powder and 1/4 teaspoon of Ajwain are added to boiling water, which is then cooled. About 30 ml of this decoction sweetened with honey may be taken thrice a day in treating such conditions.